Marketers have studied the consumer’s buying habits ad infinitum. Substantially less study has been given to the emotional/psychological side of investing. Most of it is strictly superficial, as in the old dictum about investors being driven by fear and greed. That’s too bad because emotions are every bit as important as rational thinking, especially for individual investors. That may be changing, however—even for the pros. In recent years, a school of thought called behavioral finance has sprung up to focus on the ways in which emotions affect professional investors’ supposedly rational decision-making. 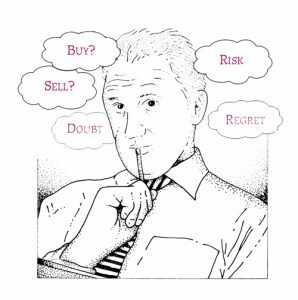 The fear of feeling stupid: When a stock an investor owns goes down, the investor suffers from what is known as “fear of regret.” It’s really one’s desire to avoid feeling stupid. Thus, most investors hold on to their losers far too long and sell their winners too soon. Losing money hurts more than making money feels good: In other words, the aversion to loss trumps the desire for gain. There is some basis for this feeling. In our experience, most clients focus on the one or two stocks in their portfolio that are down, overlooking all those that are up. Looking in the rear view mirror: The generals are accused of fighting the last war. Similarly, investors make decisions based on hindsight. They often figure that whatever is happening will continue into the future (e.g., “this dotcom thing has legs”). Call it what you will—“second guessing” or “20/20 hindsight”—the real problem is that it often acts as a deterrent to future action. Herd mentality: Standing by yourself is hard to do—it’s much easier to go with the group or buy into the “wisdom” of pundits who are quoted by the media. The trouble with this is that the experts take credit when they’re right, but don’t have to accept any responsibility for all the times they’re wrong. Overconfidence: Investors’ unrealistic expectation that they have predictive abilities. When events they thought would happen occur, these investors confirm the brilliance of their own wisdom. When unexpected events occur, they are written off as unusual, unlikely or flukes. Anchoring: Choosing a point of reference and failing to recognize change. People tend to develop their own seemingly logical rules of thumb for investing and stick with them— even when events clearly signal their beliefs are incorrect. Irrational rationality: Choosing measures that seem to make sense, but don’t. An example is the belief that a $70 stock is twice as expensive as a $35, not understanding that a stock’s price (in dollars) has little to with whether it’s cheap or expensive. The same with a fixation on calendar year performance; it’s an arbitrary time period having little to do with one’s long-term investment objectives. Market myopia: This is the syndrome of being caught up in short-term events and not focusing on the long term (and is hardly new to anyone who has read Commentary over the years). Sadly, for most investors short term is getting shorter and shorter—like daily or even hourly, or overreacting when a corporation misses or beats quarterly earnings expectations by a penny a share. Losing money hurts more than making money feels good: In other words, the aversion to loss trumps the desire for gain. At McRae Capital Management, we aren’t psychiatrists or psychologists. Clients don’t lie on a couch and share their innermost thoughts in the hope that we can devise a therapy. But the idea that we take a deep interest in each client is right on target, and we do believe we are better equipped than most individuals to manage portfolios based on analytical skills and rational decision-making. Do we ever buy a stock that doesn’t pan out? Yes (and any investment counselor who says otherwise is in denial). We accept the fact that it will happen from time to time and we recognize a loser quickly, sell it and move on. And because our clients’ portfolios are well diversified, the impact is modest. Equally important, we recognize when it is time to sell a stock that has been a long-term success for our clients because the factors that made it a winner have changed. We also focus on the concept of risk-adjusted returns. Remember the example of the cocktail party braggart? How much risk did he or she take in picking that stock that doubled? The idea is simple: Does an investment offer potential rewards commensurate with its inherent risks? It’s a basic trade-off: If investors take more risk, they should be rewarded with higher returns. The trouble is, investors don’t consider risk carefully enough, reducing their buy decision to the equivalent of a roll of the dice. Our philosophy can be summed up briefly: Invest in quality companies in growing industries possessing a strategic advantage that enhances their competitive position. As to psychology, we come from the school of thought that says one accumulates wealth through patience and trust in the progress of the free enterprise system. At McRae, we’re able to call on years of experience and professional training to make rational investment decisions in our clients’ best interests. That doesn’t mean there’s no room for emotion. We care very much about our clients. We know them and understand their priorities and do our best to help them get where they want to go. That balance of caring and investing skill is the McRae difference. If you liked our piece about the importance of taking the long view as an investor, you might like our Commentary focused on various life stages where smart financial planning can really make a difference. McRae Capital can help you understand a host of other topics, like the risks of market volatility and how to live off retirement savings.